We just wanted you to see some of the things you’re supporting here at One7. For those who donate financially, you are paying the rent for over 30 homeless children we have living at the One7 apartments. These kids all have different stories, but they ended up at our doorstep, and we took them in as our own. They all live with staff members who engage with them through daily prayer and devotion time. Your generous giving also provides One7 the opportunity to feed these kids more than just the one meal a day they usually receive while attending school. We are able not only to serve one main meal each night for dinner, but we are also able to feed them right when they get off the bus at One7 before starting after school activities, and in the morning when they wake up. You are also giving these youth, some who normally wouldn’t have it, a chance to play soccer and learn about being a team and moving forward in unity. We have several different soccer teams consisting of all ages. We seek to utilize these teams as a way to train up leaders who can then go into their own communities and become an influence for positive change. We also use the game to bridge the gap that exists with racial barriers. By intentionally building diverse teams, it forces players to work together with people from different nationalities. The One7 soccer program can also be utilized as a tool for discipleship, and we are taking full advantage of that fact. Being part of an athletic team is a unique experience, and we use our program to draw kids into an environment that honors Jesus first, above everything else. After each game, one of our captains shares his or her personal testimony with the other team. We have people that come out every week and volunteer their time to invest in the youth at One7. That is vital in our mission to disciple these kids and help them learn more about Christ. Our after school program has been a huge success since we started it last year. We had students who were failing most of their classes, but are now making A’s and B’s. It’s been a huge blessing for us to have volunteers to not only help them with their academic work, but to also take the time to form friendships. We thank you from the bottom of our hearts. Without your love and support, we would not be able to continue this amazing ministry God has so graciously blessed. Visit our website at One7,org to find out more about what we do. To find out ways you can volunteer, check out our Connect page. If you would like to sign up for monthly donations, or a one time gift, visit our Donate page. This entry was posted in One7 and tagged argentina, bible, Charlotte, christ, community, ethiopia, faith, food, god, inner city, jesucristo, Jesus, ministry, News, one7, one7video, project, salvation, shelter, soccer, story, summer, vietnam, volunteer, work on November 6, 2013 by one7blog. At One7, we hold a strong belief in the act of serving the community. It’s just a natural overflow of honoring God and loving others more than ourselves. Our ministry would fail if we kept company with just those whom we are the most comfortable around, hung out at the One7 apartments, and played soccer all day long. In our desire, and continuing journey, to be more like Christ, we feel a pressing urge to do anything and everything we can to fulfill the needs of those who are lost and hurting. 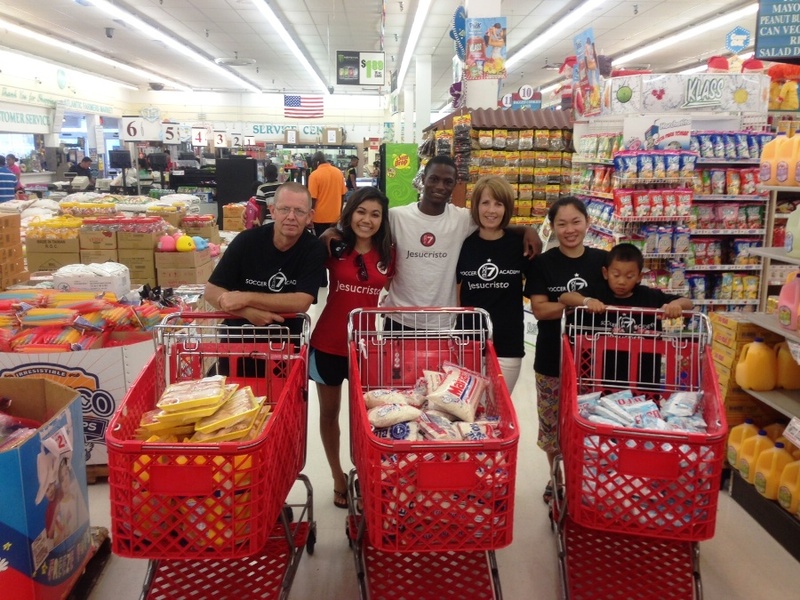 In the recent months, God has been blessing One7 with donations of food almost every day. Instead of keeping it all to ourselves, we believe God is leading us into the community, to other apartment complexes in the area, and directing us to give it away. We know the more we share with others, the more God will continue to bless us. Last week, we sent a group over to some apartments that house many of our One7 kids and their families. They stopped by a local market and picked up packs of chicken, bags of rice, and plenty of beans. We added all of that to the donations we had already received. The families began to pour out of their apartments when they realized we had arrived. We loaded the food onto the back of our trailer and served it right from there. For some, the meal we provide throughout the week at One7, might be the only one they eat for an entire day. 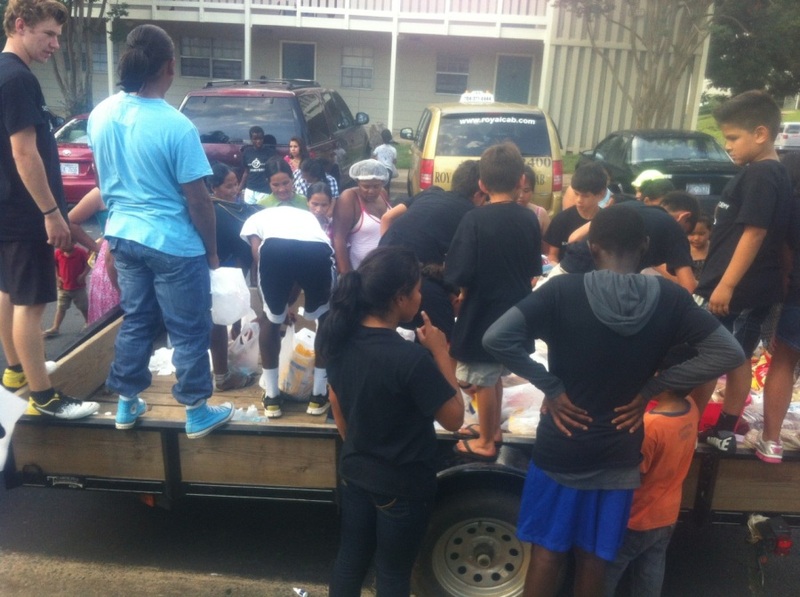 It’s such a privilege and blessing for us when we get the opportunity to deliver food directly to where they live. Romans 12:10 says “Be devoted to one another in love. Honor one another above yourselves.” There is nothing more fulfilling than serving others. When the faces of those whom are hurting light up in a brilliant smile, it warms the heart in ways that the things of this world are incapable of accomplishing. It’s all about being the hands and feet of Jesus. We dont stop at presenting items that can be seen with the eyes like food, clothing, and shelter. We also provide the hope that flows from a loving and glorious Savior. We share the Gospel, and the story of how God sent His only Son to endure the brutality of being crucified on a tree. It’s this message of eternal hope in Jesus that will fill them more than food or material possessions ever could. This entry was posted in One7 and tagged argentina, bible, Charlotte, christ, community, ethiopia, faith, food, god, inner city, jesucristo, Jesus, ministry, News, one7, outreach, project, salvation, shelter, soccer, story, summer, vietnam, volunteer, work on August 19, 2013 by one7blog. Nestled deep in the mountains of East Tennessee, a place of unparallelled peace and tranquility exists where youth from all over the country go to be physically and spiritually challenged. Doe River Gorge has been changing lives since it’s inception in 1987. It started with just small group retreats and has grown into week long camps with hundreds of youth in attendance. One7 has been blessed with the opportunity to attend these camps over the last several years. This year, we were once again invited, but with an added bonus. We were allowed to take 61 kids, which is more than we have ever taken before. The camp offers a multitude of team building and strenuous physical events that challenge even the most fearless. Campers have the chance to scale towering cliffs, rappel sheer rock walls, tube whitewater rapids, brave the high challenge course, catch a trapeze, or engage in a battle of paintball. Doe River Gorge also owns a huge lake where participants can get catapulted by the blob, play an intense game of water basketball, or soak up some rays on the white-sand beach. It’s a week filled with fellowship, fun, music, exercise, great teaching, and new friends. There’s just something so deeply moving about being tucked away in a secluded area where it feels as if God himself is smiling down at the sound of worship, laughter, and often times, tears of revival. Our kids are genuinely touched by all they see and experience during a week of camp. Friendships are re-kindled, hearts are once more softened, and God is glorified in every event. Here are some pictures from their week of adventure. This entry was posted in One7 and tagged argentina, bible, camp, Charlotte, christ, community, doe river, ethiopia, faith, god, inner city, jesucristo, Jesus, ministry, News, one7, one7video, outreach, project, salvation, shelter, soccer, story, summer, vietnam, volunteer, work on August 12, 2013 by one7blog. Two of our One7 teams had a tournament just outside Orlando, the AC Milan Cup. Our U18 and U12 teams arrived in Florida on Friday, but when they got to where the tournament was being held, they were told the games were cancelled for Friday night. That meant one of our teams would have to play 3 games on Saturday. Saying it was hot down there is the understatement of the century. It was 90, but the heat index said it felt like 100. Humidity was at 96% pretty much the entire time. Playing a 90 minute soccer game is hard in itself. Having to play in those conditions makes it even more difficult. Our U12 team lost 2 and won their last game on Saturday. Our U18 won their first game, but lost the second one. During the first game, our U18 goal keeper was injured and had to have 7 staples put into his head between games. He played through the second game with it bandaged up. As He always does, God provided everything we needed during the entire trip. A church opened up their youth building and allowed both of our teams to sleep there. When we left Charlotte, housing was the only thing guaranteed. We knew God would provide food and gas for us. He sent us some angels who went out of their way to get drinks, snacks, and food for our players. The games on Saturday were covered, but they also made a late night delivery of Gatorade for the games on Sunday. Due to storms, only two games were played on Sunday and the tournament was cancelled. This entry was posted in One7 and tagged argentina, bible, christ, community, ethiopia, faith, god, inner city, jesucristo, ministry, one7, one7video, outreach, project, salvation, shelter, soccer, story, vietnam, volunteer, work on July 4, 2013 by one7blog.